Crushed Velvet Divan Bed - Just £79! 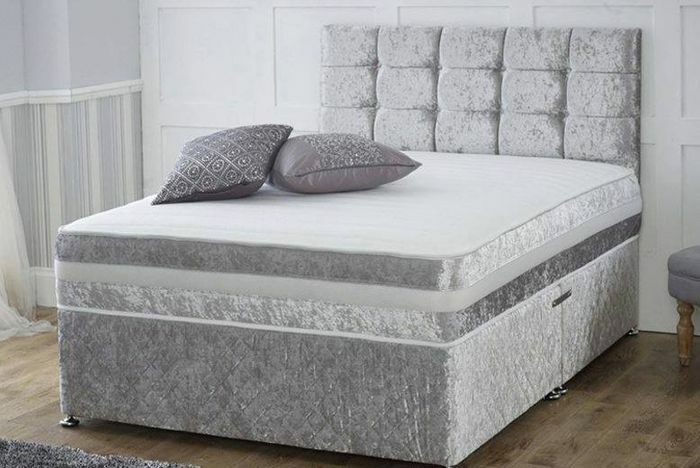 We’re offering you a crushed velvet divan bed with a mattress from just £79, saving you up to 75% off! Treat yourself to a crushed velvet divan bed! With two or four drawer options (see pricing below). As well as a choice of up to six sizes. Pick your colour from four gorgeous shades. With button detailing on the headboard. Includes an open coil spring memory mattress included. That looks comfy and its a massively discounted as well. Looks fashionable. Wonder what the mattress is like? Anyone got one of thesa beds from wowcher ? Iv been looking for a new bed off to find out how much the King is thank you. Great price! Looks great quality &very comfortable. Great price and looks fab! if you want a pretty, basic bed you cant go wrong with this. Even includes mattress! Really a Good Price. I have a grey double crushed velvet bed. They are well worth the money. and elegant looking. And really comfortable. Fantastic Price. And looks stunning I have one of these beds in a double. Fantastic buy. I have one of these crushed velvet beds in a double size. Really elegant looking. And comfy. I Have one of these crushed velvet beds in a double. Looks stunning and really comfortable. If that bed was ever worth £320 as they claim then I’ll eat my own foot. Amazing price for a Divan bed, I hope it lasts at least a few years, especially at that price. Great price. Worth having this bed in the spare room.. thanks for sharing. Amazing was looking for a new bed yesterday this is perfect!! Wow this is a bargain. We aren't looking to replace ours at the moment but if I hear of anyone, I will send them this way as that's a fab discount. That's a great price! My girlfriend is genuinely for a bed exactly like this, cannot wait to show her this, she'll be so excited lol. How much is the double?